Then-Congressman-elect Dan Crenshaw speaking with attendees at the 2018 Student Action Summit hosted by Turning Point USA at the Palm Beach County Convention Center in West Palm Beach, Florida. Credit: Gage Skidmore/Flickr. 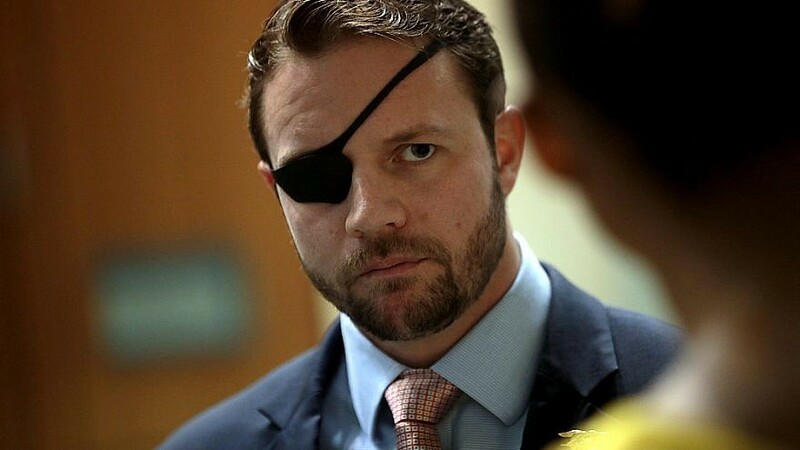 (April 3, 2019 / JNS) Republican Rep. Dan Crenshaw defeated Democrat Todd Litton in Texas’ 2nd Congressional District in the 2018 midterm elections to replace retiring Republican Rep. Ted Poe. He was catapulted into the spotlight by “Saturday Night Live” actor Pete Davidson, who made fun of the patch that Crenshaw wears over his right eye, which was lost after the Navy SEAL was injured by an improvised explosive device in Afghanistan in 2012 during his third of five tours overseas (Davidson offered an apology to Crenshaw, who accepted it and even took some zingers at him, along with conveying a unifying message for the audience). Along with five then-incoming freshmen members of Congress, Crenshaw participated on a trip to Israel in December organized by the American Israel Public Affairs Committee’s American Israel Education Fund to learn about the U.S.-Israel relationship. JNS talked with Crenshaw in person. The interview has been edited for brevity and clarity. Q: What’s your overall stance on the U.S.-Israel relationship since being there in December? A: I’m supportive. It doesn’t get any simpler than that. We need to support the U.S.-Israel relationship. It’s important for Israel, our allies, but also for the U.S. It’s a mutually beneficial relationship. Q: How’s it mutually beneficial? A: Conflict in the Middle East never stays contained in the Middle East. The world is a small place, and so U.S. leadership abroad has always been an important part of maintaining the liberal global order that has been underwritten by the United States since World War II. With that in mind, we should always be looking for strong allies that share our values. The Jewish state clearly shares our values, so we should support it for moral reasons, and we should support it for strategic reasons. Q: Having served abroad, were you able to see Israel’s threats firsthand? A: My deployments in the Middle East gave me an insight into the human element there, gave me a more realistic understanding of what Israelis are dealing within the context of Middle Eastern politics and how different that is from Western civilization. A lot of people who are skeptical of Israel and the United States, who are forming a BDS movement, are operating in a fantasy world where they actually don’t understand what the Middle East is all about. Being in Israel, you get a much more direct look at what they’re dealing with. You’re in a country whose population is close to that in my county. That’s pretty significant especially when you’re surrounded by your enemies. It’s hard for many Americans to imagine what that might be like; you really have to go there to understand that. You have Hamas fully in control of the Gaza Strip—well-armed, raining down rockets on Israeli civilians indiscriminately. You have Hezbollah to the north—digging tunnels to the Lebanese border, trying to infiltrate Israel for no other purpose than to kill Israelis. You have ISIS in Syria. There’s a long history of Israel’s Arab neighbors attempting to invade and end the Jewish state, so, for good reason, we should be worried about Israel’s security. And Iran, a powerful country that seeks to destroy Israel—and says as much and funds proxies both with Hamas and Hezbollah in order to meet those ends. Q: What is your reaction to the president’s modified announcement most U.S. troops will withdraw from Syria? A: I appreciate the modified announcement. I worked with the White House on that, as have a lot of members of Congress. I do appreciate the president is a guy who is willing to listen. It’s not the perfect outcome; I would’ve preferred the status quo. But it’s definitely better than the original withdrawal. Those troops can still serve an important purpose, even drawing down to that amount because they serve as a deterrent in many ways. It’s much easier to bolster a small presence quickly. Q: Does the U.S. military need to combat Iranian forces in Syria, including Hezbollah? Do we need a new Authorization for the Use of Military Force? A: I’m always open to restructuring a new AUMF. The last AUMF was passed in 2001. We now have different threats that the current AUMF may not include, so I’m open to renegotiating that. It needs to represent our current national security means. Q: What’s your reaction to some of the anti-Israel verbiage coming from Democratic Reps. Ilhan Omar and Rashida Tlaib? A: It represents a growing movement on the left that is deeply anti-Israel and I believe closely connected with anti-Semitism more generally. It’s hard to deny that at this point. I find it extremely troubling that Democrats couldn’t unequivocally condemn it. [House Speaker] Nancy Pelosi said she doesn’t “understand” words. That’s an absurd statement. Of course, she understands what she’s saying. She’s been trying to tell us all of this for years actually. She’s not confused. She knows exactly what she believes and she states it. And she shouldn’t be on the Foreign Affairs Committee as a result. Q: Should Omar be removed from her other committee assignments? A: I stop short there, no. Foreign Affairs Committee, in particular, because that deals with foreign affairs; it deals with our relationship with Israel. In the end, I do respect a fellow member of Congress’s free speech. The reason we called for her to be removed from the Foreign Affairs Committee is because when party leadership assigns you to a committee, it is an indication that we agree with your stances on that committee. For example, a Republican wouldn’t be placed on the Ways and Means Committee if that Republican always wanted to raise taxes. They don’t agree with our platform, so they would not put them on that committee. By putting her on the Foreign Affairs Committee, Democratic leadership is indicating they agree with her stance against Israel. Q: How is that different than Congressman Steve King (R-Iowa), who was eventually removed from all of his committee assignments? A: It’s different because we hold our people accountable, and they don’t. Q: What was your reaction to 2020 Democratic presidential candidates announcing they’d boycott this year’s AIPAC Policy Conference, even though they weren’t invited by the organization? A: The fact that they felt the need to make the statement was troubling. They could’ve just stayed silent on it; they weren’t going to go anyway and nobody would’ve faulted them for it. But they felt the need to make a statement about which, again, is troubling. It indicates they are catering to a far-left base. In this case, it was MoveOn.org. They wanted to signal to this base that they’re with them, and that they do engage in this anti-Israel rhetoric. They’re going to learn quickly that they can’t have it both ways. I’ve always welcomed nuance in every issue, but it’s very clear the direction the Democratic Party is going when you have a good portion of the leading presidential candidates unequivocally stating they’re not going to AIPAC and participate there. Q: You opposed the 2015 Iran nuclear deal. What’s your stance on the waivers some countries received over importing Iranian oil? A: I think we should look at each waiver pretty carefully. Q: What was your reaction to the United States relocating its embassy in Israel from Tel Aviv to Jerusalem? A: Supportive, unequivocally. It’s the right thing to do. Every president said they would do that, and they didn’t. They didn’t have a good reason as to why not, and I’m really happy to see our president actually be bold and keep the promises he made. Q: What was your reaction to America recognizing Israeli sovereignty over the Golan Heights? A: Supportive, unequivocally. What we’re supporting is a reality we all knew existed, and we needed to just say it. We need to go further and put it in a statute to support the president’s decision on this. There is no reason to ever even consider the notion of Syria having the Golan Heights. It is a military high ground that historically was used to bomb Israeli civilians. There’s no reason to think that, especially given the current Syria regime, supported by Iran, there’s no reason to consider ceding that over. Q: What’s your stance on American taxpayer funding for the Palestinian Authority even for humanitarian purposes? A: I agree with the president that we need to make a strong stand on this and say that if you’re giving payments to Palestinian terrorists for committing terrorism, that money shouldn’t be coming from the United States taxpayer. We need to be continuing to pressure the Palestinian Authority to avoid that kind of what is really a moral crisis. I support the president’s decision to scale that back considerably. Q: What are your thoughts on America supporting Lebanese Armed Forces, who have worked with Hezbollah? A: The American relationship with Lebanon is important. It’s important because if we leave there, that gets completely taken over by Hezbollah. I would caution everyone to be purist on the American relationship with Lebanon. Israel needs the United States inside Lebanon. It’s extremely important for Israeli security because there is a real fear that Hezbollah continues to gain even more influence in the Lebanese, and that’s the last thing we want to see. Q: What’s your reaction to the anti-BDS component of the Senate bill that would also strengthen the U.S. relationship with Israel and Jordan, in addition to enacting fresh sanctions against Syria, citing free speech concerns? A: Those are nonsensical concerns. BDS movements are not about free speech; they are a concerted effort to destroy a nation’s economy. That’s not free speech. That’s vile. That’s contempt for the Jewish state. To say it’s free speech is a really wrong talking point. It wreaks of desperation. Q: How do you feel about the latest waves of anti-Semitism at home and abroad? A: We always have to be looking for ways to combat it. A lot of that is through education—through exposing people to what Israel has dealt with, exposing people to those arguments and the realities of those situations because it’s something we have to stomp out. In the modern world, anti-Semitism doesn’t have a place. Q: Is there anything else our readers should know about you? A: I personally got to see the magic of Israel and the real sense of the Jewish people there. It really does change you. It’s really such an experience, and I can’t wait to go back.